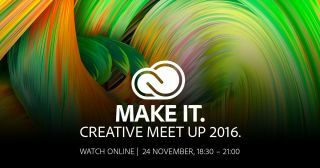 Get ready to watch Adobe’s Creative Meet Up – live from London today! Tune in right here on Creative Bloq to watch all the action unfold live from Adobe’s Creative Meet Up. Today, some of the world’s most creative minds will gather in London’s cultural hub of Shoreditch for an evening of inspiration, advice and creativity at Adobe’s Creative Meet Up. And from 18:30 (GMT) onwards, you can watch Adobe’s live stream from the event right here on Creative Bloq. There’s a top-notch line-up of speakers in store, with talks from multi award-winning designer Jack Renwick, graphic designer and founder of Draplin Design Co. Aaron Draplin, freelance illustrator Dan Mumford and Adobe Evangelist Rufus Deuchler. If that’s not enough to whet your creative appetite, Adobe will also be showcasing its next generation Creative Cloud innovations, including details of major updates to all of your favourite Adobe tools, as well as an introduction to Project Felix, an industry-first design tool that enables graphic designers to create high-quality photorealistic images by combining 2D and 3D assets plus much, much more. So if you’re suffering from a mid-week slump, this is just the event to get those creative juices flowing again. Trust us, you won’t want to miss it. Simply tune in, right here, from 18:30 (GMT) to follow all the action! And don’t forget, you can join the conversation on social using #CreativeMeetup.